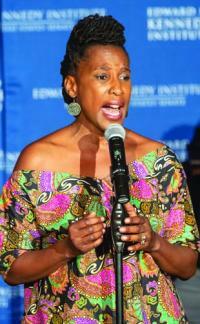 U-Meleni Mhlaba-Adebo has been places and seen a lot. Born in Leominster, Massachusetts, she spent her growing-up years in Zimbabwe, Botswana, and South Africa before moving back to her home state for college studies. Now a Dorchester resident, the multi-talented Mhlaba-Adebo is a poet, storyteller, musician, actor, and educator who also runs marathons for charitable causes. Most recently, she was one of 18 Bostonians profiled for the city’s #StandWithImmigrants public art project that kicked off at the Edward M. Kennedy Institute for the United States Senate last Thursday. The photographer Erik Jacobs is the creative visionary behind the project, which projects giant portraits of immigrants onto buildings around town. “He wanted to do something big, and he thought that projecting images of people would be a big way to start a dialogue,” said Mhlaba-Adebo, whose face looks out from the side of the Schubert Theatre on Tremont Street, a nod to her creative spirit and her penchant for the arts. Using the portraits in this way was key to one of the main goals of the showcase – to increase the visibility of immigrant members of Boston communities, the work they do, and the critical roles they play in our society. Creators and backers of the exhibit hope it will eventually travel city to city as a way to show the wide-reaching impact of immigrants in every part of the country. After the storytelling portion of the event, which also featured performances by a Syrian and a Burmese immigrant, there was a Q&A session during which, Mhlaba-Adebo said, many people asked her what they can do to support immigrants and counter the narrative proposed by the current White House administration. Her response was that they should start with small, simple actions. “One of the first things you can do,” she said, “is if you don’t know someone in your community, make an effort to reach out; meet somebody different; learn from them and get to know their culture.” She also listed supporting initiatives, artists, and organizations like the International Institute of New England and the Center for New Americans as ways to make a difference. She is an advisory member for Write on the Dot, a neighborhood organization and reading series that amplifies the voices of local poets and writers. Run by a group of UMass Boston MFA students, Write on the Dot aims to build and connect Dorchester’s literary community. Related article, Page 8. It’s one of the several artistic havens that Mhlaba-Adebo sees as making Boston great, despite its problems and its inequities. “I have a deep love for the city and its residents who share a vision of respect and community,” she said. In addition to being an artist, Mhlaba-Adebo is also an avid marathoner who frequently runs in support of causes such as mental health awareness, suicide prevention, and cancer research. She has run the Boston Marathon in the past, and in a few weeks she’ll be running the Dot Day 5k.